Many Koreans wonder what has happened to Sony, which used be the global top TV provider in the 1990s. The Japanese electronics maker closed its TV business in Korea in 2013, squeezed out by Samsung and LG Electronics. However, Sony did not give up on the Korean market, focusing on camera and audio businesses that are still the world’s No. 1. 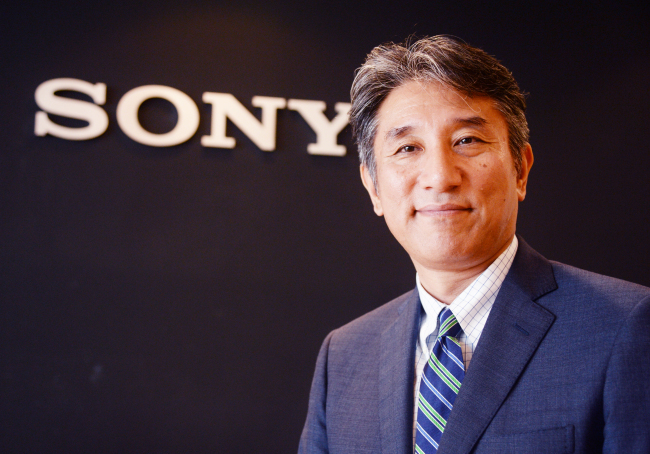 Although digital technologies may be changing fast, amid fierce rivalry among Korean electronics makers, Sony’s long-held analog technologies will not be easily caught up with, said the chief of the Japanese tech giant’s Seoul office. “Camera and audio products are digital devices, but their output is analog signal such as pictures and sound, and Sony has a more than 70-year-old history in audio and visual.” said Morimoto Osamu, CEO of Sony Korea in an interview with The Korea Herald. “In (the) case of digital, everyone can copy, but in (the) case of analog, it’s not easy to copy, and this is one of our advantages,” he said adding that the company has in-house technologies such as image sensors, optical technology and data processing. Sony Korea has kept the top spot in the mirrorless camera market for seven years since 2010. It has also been the No. 1 in the high-end camera for five years since 2012. Sony believes its strength lies in its ability to develop products that exist at the closest point of contact with its customers and to resonate with them on an emotional level. The CEO underscored that interactions between humans and machines, and the company’s Last One Inch strategy is what can connect people to products in the digital world. “The digital world is getting bigger for sure. However, in the end, users are human beings. So (the) man-machine interface never disappears, he said. To highlight Sony’s confidence in translating human emotions through tech devices, the Japanese firm opened a new Sony Center in Namdaemun, central Seoul, on July 21. The opening of the new center is part of Sony Korea’s premium strategy for the market, where the company decided to reinforce sales of high-end camera products after losing to local competitors like Samsung and LG in the TV market. At the center, visitors can experience high-end Sony products ranging from cameras to mobile devices. “Korean consumers seem to follow major trends. This is both an opportunity and a challenge for us because Sony always strives something unique. However, we never give up and will focus on ‘Last One Inch’ with our customers,” Morimoto said. The center is the eighth in Korea, and one more is also planned to be open within the year, the CEO said. Morimoto has been leading Sony’s Korea business since 2015. He joined Sony in 1981 as an engineer for the semiconductor business. He worked for semiconductor sales since 1987, until he came to Korea. Sony’s smartphone business is sluggish not only in Korea but also worldwide due to the strong leaderships of Apple and Samsung. However, Sony will never give up on the mobile business, Morimoto stressed. “At this moment, we are having mobile business through selected channels,” he said. “But smartphone is quite important, as it is a hub product that connects with other Sony products. Sony launched the Xperia XZ Premium in Korea in May, which the company describes as the world’s first smartphone with a 4K HDR display and 19 MP Motion Eye camera with super slow motion that records videos at 960 frames per second, premium audio technology and an elegant mirror design.